The most unique accessory that converts any drilling and screwing works to be more efficient and pleasant. Quick release enables easy and fast way to change tool for drilling hole and screwing. Attached with our unique "Drill & Drive bit", including: No.1 x 2mm (3/32") drill. No.2 x 3mm(1/8") drill, and NO.3 x 4mm(5/32")drill. 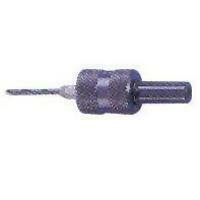 3/8" shank-fits chuck of power drills, Maximum RPM2,500.